School might be out during the summer, but No School, 2727 California Street's art education summer camp for kids ages 7-17, is in session. At last year's summer camp, students wrote poems based on the theme "If You Walked Into My Heart," and the students were so excited about their poems that they decided to do an impromptu poetry reading. An eight-year-old eagerly stepped up as the emcee and introduced a teenage student, who nervously read her work to a crowd of mostly nine-year-olds. Director and artist Lydia Glenn-Murray, founder Marc Hellerstein, and Emily Jane Rosen opened 2727 California Street last year, located at the intersection of California Street and Ward Street in South Berkeley. 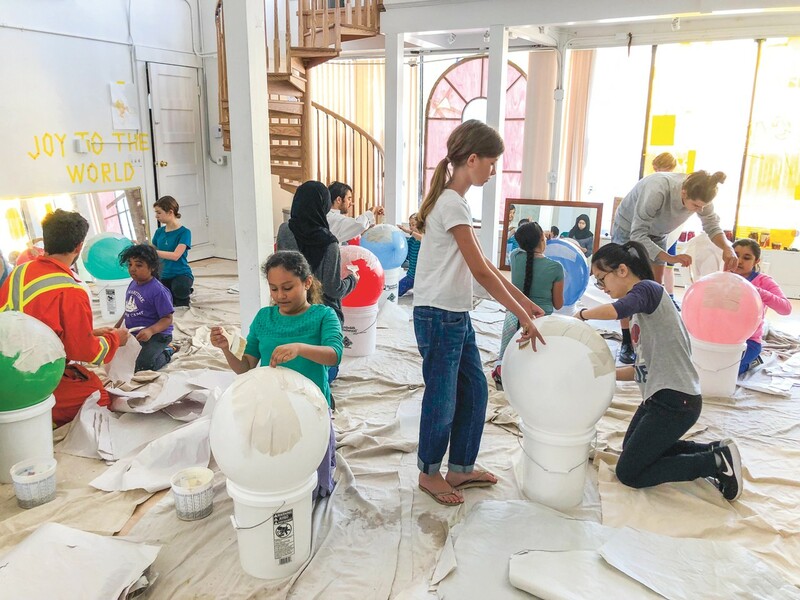 It's a non-profit arts and education initiative that offers both summer camps and Sunday studios under the No School program, plus artist residencies, workshops, and community events. All events are free or pay-what-you-can, and programs are offered for kids and adults alike. It's how 2727 California Street achieves its goal of helping everyone tap into their inner artist while also learning life skills like courage, resilience, and open-mindedness. Glenn-Murray brought on board the program's first resident, Frank Traynor, to help design 2727 California Street's education program. The residency was originally supposed to be short-term, but Traynor ended up staying permanently as the director of educational programming. Traynor had worked with a similarly broad range of ages at a youth arts education program he ran in Rockaway, New York, and decided to bring a similar model to 2727 California Street. "It seemed like a kind of risky experiment at the beginning," said Glenn-Murray. "And then it just worked so well that it's become a really cherished part of the program." Younger kids help older kids let their guard down, while older kids help younger kids lift heavy screens used for screen printing or operate a drill. The mix of ages encourages a spirit of collaboration, which is essential to 2727 California Street's goal of helping everyone tap into their inner artist while also learning life skills like courage, resilience, and open-mindedness. At No School, students exercise their creativity in unusual media beyond drawing — a medium that Glenn-Murray finds often makes kids nervous because they have preconceived notions about whether they're "good" or "bad" at drawing. But with unfamiliar forms of art, students don't hold any ideas about what they're "good" or "bad" at, allowing for uninhibited creativity. Traynor likes working with large-format media that kids wouldn't typically get to work with at home or at school, so last summer, participants at No School built a wooden building using drills, then decorated the building with drop cloths they dyed themselves. Students collected leaves from the neighborhood and used them to make sun prints, which they used to decorate the doors and make outfits with their leaf designs. They also wrote poems and learned to make hummus, pickles, and bread. Every student is required to try every activity once, but afterward, students are free to work on whatever activity interests them the most. "[We want] to have kids following their own curiosity and intrigue, and that doesn't necessarily mean doing the thing that they're used to doing," Glenn-Murray said. At the end of the program, students celebrated their collaborative efforts by reading their poems and sharing a meal of hummus inside the building they had made, all while wearing their leaf-inspired outfits. Developing collaboration skills is a major goal of No School. "How can people work together in a meaningful way where they all feel like their contribution actually matters to them, and that there's actual negotiation and surprise and stretching and working together?" Glenn-Murray said. No School also has programs that are open to both adults and kids, though not necessarily directed towards parents and their children, as are many "all-ages" arts programs. At a puppet-making workshop led by Berkeley artist Annie Hallatt, Glenn-Murray witnessed an eight-year-old girl collaborating with Hallatt's adult assistant. "And it wasn't like he was like teaching her, but really they just collab'ed," Glenn-Murray recalled. "They collab'ed really hard on this amazing, weird thing." At one all-ages drawing workshop, an instructor dressed as a scarecrow, and kids began placing flowers on the scarecrow. That encouraged the adults to come out of their shells. "I think figure drawing is something where accuracy and skill comes into it," Glenn-Murray said. "But there was a spirit of play and experimentation that the kids were leading, and then the adults were able to loosen up, too." The drawing workshop was so successful, in fact, that Traynor and Glenn-Murray are launching a new all-ages workshop series on Monday afternoons at 3:30 p.m. called "Drawers." For the first few minutes, anyone, kids included, can volunteer to teach the group how to draw something. The remainder of the sessions will be dedicated to self-directed drawing. 2727 California Street also recently unveiled a brand-new print experimentation studio, where anyone is welcome to come in and print and bind up to 500 pages for free. So far, there are plans to produce books with several local figures, including Berkeley-based author and Heyday Books founder Malcolm Margolin, local poet Gary Turchin, and 97-year-old local Cherokee poet Roy Culver. It's an embodiment of 2727 California Street's philosophy that art, along with all the lifeskills that go with it, is beneficial to people of all ages and backgrounds. "It's about art education that wasn't towards creating more artists, but towards developing skills that anybody might benefit from in their life," Traynor said. "Openheartedness and mindful risk taking and all of these sort of things ... that you might do just at any time during your day."